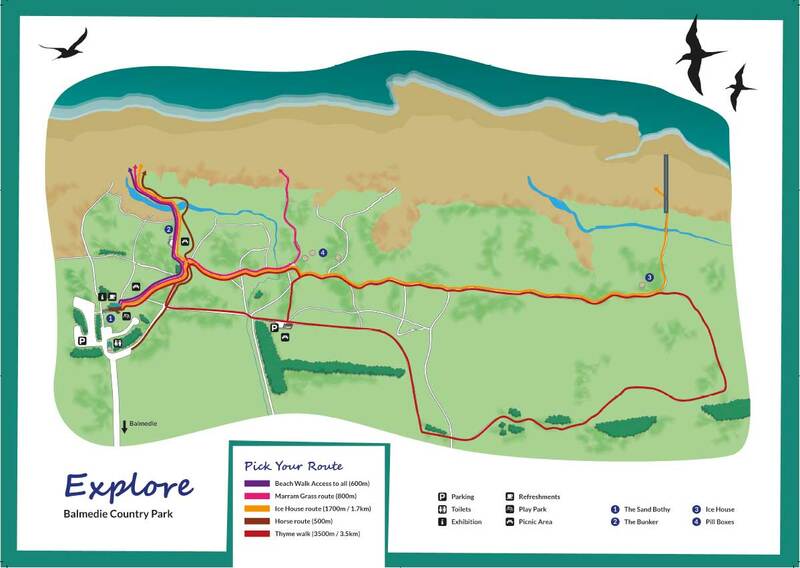 Once you are in Balmedie follow signs for the Balmedie Country Park and the Sand Bothy. The Bothy is at the end of the car park. The Bothy does not have public toilets but there are toilets in the public car park next to the Bothy. We have picnic areas surrounding the Bothy and in the dunes. If you are bringing a BBQ please be careful to place this away from fire hazards. There are only limited litter bins so please help by planning to take your litter away with you. We have a map of the paths through the country park. Please click on the image for a larger version. Inside the Bothy we have a family friendly exhibition about the park where you can find out about the park’s beach, wildlife and environment. Our room is also available for hire as a space for your class, group, events and workshops. You can find out more on our facilities and room hire pages. We do not allow animals other than assistance dogs inside the Bothy building. But we do provide water bowls for dogs outside when the kiosk is open. We hold a wide range of events at the Bothy from Santa’s grottos, Easter egg hunts to writing classes. There are also lots of chances to volunteer at the Bothy or at events like our recent beach clean with surfers against sewage. You can find out more on our events and volunteering pages. Our Kiosk serves snacks, ice cream and hot and cold drinks. We are open from March to October every Saturday 12 noon to 3pm and Sunday 12 noon to 4pm. We also open for special events at the Bothy and additional weekends. Check our Facebook page for extra opening times. We always need more volunteers to help with the kiosk so if you are interested in volunteering please get in touch. You can contact the Bothy team on email or send us a message here using the contact us page form.